Travel Ban At The Supreme Court: National Security Experts Come Out Against It The Supreme Court hears arguments on the ban Wednesday, and a bipartisan group of former national security officials from the Reagan to Obama administrations are urging the court to strike it down. Former Central Intelligence Agency Director Gen. Michael Hayden, who served under Presidents George W. Bush and Barack Obama, has come out against the Trump travel ban. The reaction is astounding in terms of both numbers and gravitas. Among those lending their expertise to three friend-of-the-court briefs are more than 55 former officials from Republican and Democratic administrations, including CIA directors, national intelligence and counterterrorism chiefs, top diplomats with long records working in the Middle East, secretaries of state, some two dozen top-ranked retired admirals and generals, a former Republican attorney general and even the Republican chairman of the 9/11 Commission. All are strongly condemning the Trump travel ban as an over-the-line use of presidential power that is counterproductive and antithetical to American values. 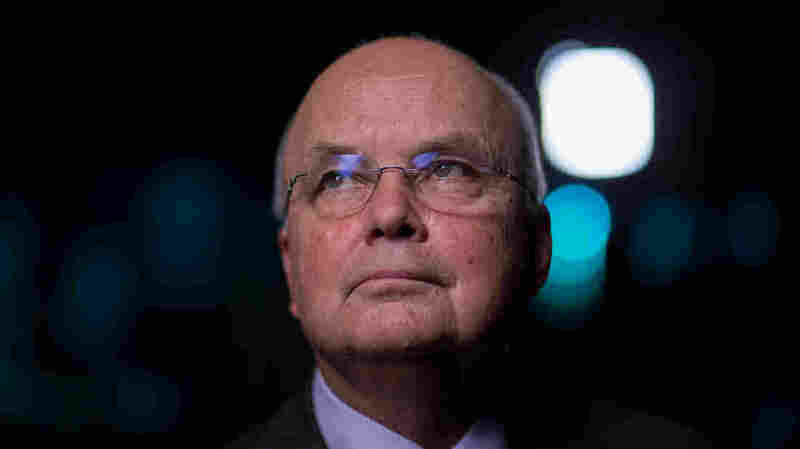 The travel ban, "in addition to being unjust," has "actually made us less safe," Gen. Michael Hayden, who served as director of the National Security Agency from 1999 to 2005 and as CIA director from 2006 to 2009, told NPR in an interview ahead of the arguments. 1. "Maybe I did some things that some people think were less than who we are. ... We support a bunch of it, so when we don't support something, we owe it to the broader community to explain why." Hayden: "We Have A Greater Obligation Than The ACLU"
Hayden acknowledged that he and many others who are opposing the ban have, in the post-Sept. 11 world, supported "some pretty tough measures" that were "closer to the edge" than many outside the intelligence community would have liked. Perhaps because of that, he said, he and the other national security experts have a "greater obligation ... to speak up" when a president goes too far in the name of national security. 2. "It was indicative of something else we were really worried about ... non-fact-based decision-making in what was looking like a nontruth world." Hayden: "It Was Indicative Of Something Else We Were Really Worried About"
Also central to the signatories' concern, Hayden said is the "non-fact-based decision-making" in a "post-truth world" that led to the ban. The danger that the ban "is pretending to respond to," he contends, is the "byproduct of red meat rhetoric during the campaign," not data or analysis. 3. "None of this comes from an analysis of the threat." Hayden notes that in other administrations, a directive like this one would have, from the beginning, been subject to interagency review. In the past, the intelligence community has provided affidavits in court attesting to why a particular policy is needed. In contrast, he observes, "There is not one single official willing to swear on the record to a national-security-based need for the travel ban." Hayden continued, "Go look at anyone who is occupying our old positions now and you will be hard-pressed to find statements by them in support of this executive order." They have been ordered to "shut up and get on board," he charged. So "the retired guys" decided to speak up. Hayden added that his former colleagues still in the CIA privately warn that the ban is making the U.S. less safe. He points to conversations with CIA case officers who worry about how the ban is affecting recruitment in the travel-ban countries, where the U.S. does a lot of intelligence business. 4. "We have a greater chance of recruiting people we have recently been shooting at than people whom we insult by saying their entire nation, their entire tribe is denied entry to our homeland." Hayden: "It Was The Promise Of America"
"It was the promise of America that allowed us to recruit people" in the past, Hayden said. "Just think of the impact of a pronouncement from the American government that people from that country, where you've just recruited, are never allowed ... to enter this country. You have taken off the board the last sanctuary that the case officer uses" to help recruit someone. And that, said the former CIA director, is what is happening now. 5. "When we act like this, we reinforce the arguments of those we want to lose." There is a civil war going on within Islam, Hayden added, and "we have some preferences as to who we would like to win that internal argument." Former CIA Head: Greatest Force For Instability In World Is U.S. When the U.S. acts like this, he said, it reinforces the narrative of ISIS and al-Qaida, who want the Muslim world to see "undying enmity between the values of Islam and the values of the West." Indeed, the brief points out that nationals from the eight countries listed in the ban have committed no deadly terrorist attacks on U.S. soil in the past 40 years. Since Sept. 11, 2001, 14 terrorists have committed deadly domestic attacks in the name of Islam. Of those, most of the perpetrators were natural-born American citizens. 6. "A proclamation that just seems to fly in the face of the essence of American-ness." Hayden acknowledges the current version of the ban, the third effort by the Trump administration, has been improved over the other two. But it can't get away from its "original sin," he said. "Its original sin is this is a Muslim ban." Hayden admits that after the Sept. 11 attacks, President George W. Bush did a lot of "tough and remainingly controversial things," but he did them "with care," Hayden maintained. Bush visited a mosque, refused to impose any sort of blanket national ban on travel and was careful to use language so the world would "not perceive Islam as the enemy of the West." Our "great national strength," Hayden and his colleagues maintain in their brief, is that the we are "a welcoming nation." As Hayden puts it, "We assimilate immigrants, we know how to do it, and here is a proclamation that just seems to fly in the face of the essence of American-ness."